Many anti-Semites complain that modern Jews are not the Biblical Jews but are descended from the Khazars. The Khazars converted to Judaism and thus modern day Jews, it is claimed, are imposters who have no claim on the Land of Israel, Eretz Yisrael. This claim will be discussed in the following sections. It is also interesting to note that the same anti-Semites who complain about the alleged contents of the Talmud, which was completed no later than 500 C.E. also claim that the Jews of today are “self-styled Jews” descended from the Khazars who converted to Judaism in 740 C.E. Some even claim that the “true” descendants of the Biblical Jews are the modern day “Aryans”. So according to this “logic” the Talmud which they complain about would actually be an “Aryan” book and not that of the modern Jews! It is difficult to see how they can reconcile these two seemingly contradictory positions. As for Ashkenazim being Khazars, for one thing there were Jews on the Rhine (who came with the Romans) long before there was a Khazaria and even before many Germanic tribes settled there. In fact, the word Ashkenaz means Germany in Hebrew. Second, even if a group of Khazars abandoned their own homeland and adopted Jewish people-hood by conversion it still doesn’t negate their right to the land of Israel. Even Moses’s wives weren’t born Hebrews and Ruth the Moabitess was a convert (see Book of Ruth). Unlike the Germans, membership in the Jewish people hood is not based solely on blood. Judaism has never defined Jews on racial grounds. Anyone from any race is welcome as a convert to Judaism as long as he or she is sincere. The following article addresses the issues of the Khazars with reference to a particular anti-Semitic film where the same claim is made. From “The Other Israel – Is it Really Accurate”, 1990 Dennis Green, Stuart Hayward, Phillip Woodfield Opposition to Anti-Semitism, Incorporated, Christchurch, New Zealand. In the film, Ted Pike makes the assertion (as have most anti-Semitic groups, including the Nazis) that the Jews of European origin, the “Askhenazim” (who comprise almost 80% of today’s Jewry), are actually descended from a medieval people called the Khazars, who converted to Judaism in the 8th century. The logic of the argument goes something like this; if 80% of all the Jews in tile world are not really Jews, then, firstly, these Jews have absolutely no claim, biblical or otherwise, to the Land of Israel. Secondly, these Jews are in no way the people of God, and thus, have no place in the promises or plans of God. Thirdly, if the vast majority of present-day Jews are not Jews (therefore, not Semitic) at all, then it cannot be considered “anti-Semitic” to oppose them. Pike states that ‘Today, the Askhenazim, or Khazars, form the majority, Around 80 %, of those who call themselves Jews.” He claims that the Mongols drove the Khazar-Jews into Germany, Poland and Russia in the 13th century, and that these, not “real” Jews, are the people who now make up most of the population of Israel. Quite simply, this is not true, as the basic analysis below will show. The Khazars were a confederation of Turkish tribes who established a major commercial empire in the second half of the 6th century. As a trading nation, they were faced with a dilemma; Christians would not trade freely with Muslim nations, and the Muslim nations would not trade freely with the Christian nations. The Khazars did not want to be recognized as being more partial to one faith than the other. Therefore, around 740 C.E., King Bulan adopted Judaism, and thus, as a “neutral” people, the Khazars could trade more freely with both the Christian and Muslim nations that bordered Khazaria. It should be noted, however, that it was only the “ruling class” that adopted Judaism, not the general Khazar population, as Ted Pike and the other anti-Semites claim (1). These Khazar-Jews had little, if any, contact with the central Jewish organization in Iraq, or with the Jews who still lived in Palestine (as the Romans had renamed the province of Judea in 135 C.E.). These Khazar-Jews had, in fact, closer links with the (Christian) Byzantine Empire, as can been seen by the fact that several Byzantine emperors, including Justinian II (704) and Constantine V (732), had Khazarian wives. By the 10th century the Khazar Empire, faced with the growing strength of the Pechenegs to their north and west, and of the Russians around Kiev, suffered a decline. Khazar power was crushed in 965 when the ruler of Kiev, Svyatoslav, launched a harsh military campaign against them. Many Khazars, including some of those who had converted to Judaism, moved into Bohemia, Russia, Germany, and the Ukraine. The main error with Pike’s argument is his belief that the Khazar-jews are the ancestors of all those Jews who have lived in Northern or Eastern Europe, and therefore, the Askhenazim (Jews of European origin) are not really Jews at all. This argument can be demolished very simply, by showing that there were very large Jewish communities in Northern and Eastern Europe before the Khazar-Jews arrived there, and that these (with perhaps a tiny percentage of Khazar-jews) are the ancestors of the Askhenazim. Thus, these Jews are clearly descended from the Jews of the Bible. Jews arrived in Pannonia (Yugoslavia) and Romania in the Third Century (4), and in Hungary not long after. France also had large numbers of Jews living there from an early period; Objects identified as Jewish because of the menorah portrayed on them have been discovered around Arles (first, fourth and early fifth centuries) and Bordeaux and the neighboring region (third and early fourth centuries) Evidence of Jewish communities is abundant from 465 onwards. Jews were, of course, living in all Mediterranean countries for many centuries B.C.E. and, as has been shown, were living in most other European lands from a very early period. Thus, the claim of Ted Pike (and most other anti-Semitic groups) that the European Jews are from Khazar stock, falls flat on its face. There may be a tiny minority of present-day Jews who are descended from Khazar-Jews, but almost all European Jews are descended directly from the Jews of the Bible. This is also an extract of an article that addresses the lies presented in the anti-Semitic video “The Other Israel”. The video alleges that the Ashkenazim are Khazars and only the Sephardim are authentic Jews. In other words, that the majority of Jews in the world today are descended from a heathen, nomad people from central Asia, and not from Abraham. In support of this contention it states that Jewish missionaries went to Khazaria and as a result the king was converted in A.D. 740 and Rabbinic Judaism became the state religion. It is averred that by the 10th century the Khazari people had convinced themselves that they were descended from Abraham, that they settled in Poland, and that they were the Polish Jews from whom the Ashkenazim, who make up the greater part of Jewry today, were descended. There is enough truth in this assertion to make it seem plausible but unfortunately it flies against the facts. In about A.D.700 the Khazar king was converted to Islam and later to Judaism. A later king, Obadiah, greatly strengthened Judaism, inviting rabbis into his Kingdom and building synagogues. Their Judaism – limited no doubt in any case to a comparatively small group (only the king, his attendants and the Khazars of his kind) – was always superficial and they were liable to relapse into paganism. They became what could best be called Judaized Turks. Religious toleration was maintained for the Kingdom’s 300 years, with clear traces of Christianity being found among them for the whole historical period. The predominating element in the country were the Muslims, and they formed the royal army (3). In the 10th century, “probably in 965, Khazar leaders appealed to a neighbouring Islamic state for help against invasion but were told that the price of assistance was Khazaria’s conversion to Islam. According to Muslim historians the kingdom that had embraced Judaism around 740 suddenly abandoned it less than two and a half centuries later. But this did not save them and by the end of the eleventh century the Khazar Empire was no more.”(1) There are persistent references to the Khazars as Muslims after A.D. 965(3). To encourage their own people, Jewish writers have tended to exaggerate the importance of the Khazar conversions to Judaism, leaving out unpalatable facts. The smallest group among the Khazars was the Jews, most of them being Muslims and Christians. The king and his court were Jews for much of their 300 years history and because religious toleration was maintained many persecuted Jews fled there. The fact is that rather than convince themselves by the 10th century that they were Jews descended from Abraham, they found it expedient to convert to Islam. This is not to say that the occasional occurrence of a fair, light skinned, eastern European Jew doesn’t indicate the possibility of some admixture of Khazar blood. However from the thirteenth century there came a great movement across the face of Europe, which was to continue for the next four centuries, to the hospitable lands of Poland and Lithuania. (5)’ ‘For long generations, therefore, Poland continued to appear in the light of a land of promise for the Jews of northern Europe, and to receive a perpetual accession of new settlers – refugees escaping from massacre, young men seeking opportunity, merchants from as far afield as Italy or the Balkans. In 1500, the number of Jews in the country is estimated to have been only 50,000 souls; a century and a half later, it had risen to half a million. …so from the beginning of the sixteenth century the overwhelming mass if Askenazic Jewry, the remants of the communities of medieval England and France and Germany with others from further afield – became concentrated in Poland and the surrounding Slavonic territories. 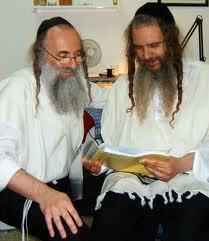 It is from them that the majority of the Jews in the world today are descended.” (4). (13) David J. Goldberg and John D. Rayner, (1987). The Jewish People, Their History and Their Religion. Apart from the historical evidence proving that a vast majority of present-day Jews did not descend from the Khazars, there is now also genetic evidence. Among the Jews there is the class of priests called Cohanim who served in the Temple and who now carry surnames such as “Cohen” and many variations on that name. Cohanim comprise of about 5% of the male Jewish population. There are strict rules of marriage for the Cohanim and the title is only passed through the male line. Also, converts cannot become Cohanim (but their children will be if they have a Cohen as a father). The priestly line is descended directly from the Aaron of the bible so it is expected that all Cohanim would carry some common genetic features. The large number of Cohanim among present-day Jews and the fact that they have a common genetic lineage traceable to Israel at the time of the Temple demonstrates that modern Jews come from a population pool derived from Israel and not from the Khazars. The Khazars could not have developed their own lineage of Cohanim anyway, since being a Cohen is a male-inherited status which converts (the Khazars) could not have obtained. (1) Skorecki K; Selig S; Blazer S; Bradman R; Bradman N; Waburton PJ; Ismajlowicz M; Hammer MF (1997) Y chromosomes of Jewish priests. Nature, 385:32. Very good. Too many people seek to rewrite history for their own (nazi)political agenda! I told a few messy antics that my family died in the holocaust. That’s not fake. The concept of fake Jewry ticks me off. Its antisemitism. @char: It surely is. You have to be both stupid and illiterate at the same time to believe such a story. Hitler surly never went after the Khazars. And the Ashkenazim were in the Rhine long before there was a Khazaria. According to old Icelandic saga’s, the Nordic (Germanic) tribes came from the Caucasus area. The Icelandic historian Snorre wrote around 1220 how Odin (Wotan) left an area east of Don as the Roman army attacked the area. We know from history that the Romans attacked the Caucasus area in 65 CE. Odin’s tribe could not hold, and flew west, through Russia and into Germany leaving small groups along the trail. They ended up in Odense (Odins eye or island), Denmark (Dan’s land). Some went all the way to Sweden. Odin decided to move to this part of the world because it was decided from old times that his tribes should have this area. These tribes wrote runes on stones and spoke a language not very different from old Icelandic. Now we come to a strange fact: Most runic inscriptions can be red if you know old Icelandic. But a number of stones in southern Sweden could not. These stones are from the first century BCE. No one was able to decipher the inscriptions until a Swedish scientist tried with Hebrew and Aramaic. And there it was. Someone made inscriptions in stone mentioning Israel, different Israeli tribes, Ha Shem, Baal and the desolation of the land 100 years BCE. How come? Who did it? Where they Jews? Or are we here talking about remains of the 10 tribes? Forget the Khazars, this is almost 700 years before they appeared. still haven´t had the time to read it, but very interesting subject and blog.kola ha kavod!!! Yet, the re-writing of history ( or cover-up) is widely accepted in the case of the LEMBA’s. There’s tremendous antisemitism against Ethiopian Falashas and Lembas, but few are concerned about them nor do mainstream Jews consider them real “Jews” — why is this? I am glad a moron like you appreciates it!! I have been interested in the khazars for a long time. Thank you for posting this. BTW, could the person whose initials are M.G. be Moron Gadol? I do not know what the initials MG are. But I think moron gadol is very appropriate! I always get confused when they refer to Jews as being fake Judean/Israelites at the same time they are called Christ Killers and that their ancestors said let it be on their heads. Make up your mind. Good work Menashe. Life and history are not coincidences. The restoration of Israel is G-d’s work and he has carefully selected each and every person who is there. There’s no doubt that some of the Khazars were assimilated into Jewry as were Yochabed, Rahab, and Ruth (who you mentioned). As you also wrote, a “mixed multitude” came out of Egypt.I do believe that G-d has made certain irrevocable promises to the physical descendants of Jacob, but His promises don’t require a genetic percentage—a smidgen of Jacob’s genes will do. G-d seeks all opportunities to bless so He is inclusive. It is man who seeks to exclude. I believe that G-d has preserved far more of the seed of Jacob than is apparent. How many Jews have hidden their identity, even from their own children, to avoid persecution? My theory is that G-d is repeating what He did with Gideon’s army. He will reveal to the world that The G-d of Israel is G-d by limiting the population of Israel so that man cannot get the glory for Israel’s survival against all odds. Just as he pared down Gideon;’s army, he has extracted only a handful from the seed of Jacob. He extracted the Hebrews from the Gentiles. Then He extracted Judah from the Israelites. Now he has extracted the Israelis from Jewry. Just my theory.